Grasping the Resolution of the Party Central Committee’s 4th Plenum (12th tenure) on Party building and rectification, the Party Committee of the Infantry Officers’ Training College No.2 has adopted various measures, with a focus on overcoming its limitations and weaknesses, thereby contributing to building pure, strong College’s Party Committee, meeting the requirements of its leadership over the task of educating and training army cadets. Perceiving the position and significance of the implementation of the Resolution of the Party Central Committee’s 4th Plenum (12th tenure), the College’s Party Committee and Directorate have determined that it is a large political movement in the whole Party Committee that should be implemented seriously so as to help party committees and organizations, cadres and party members of the College fully understand risks and find out practical measures to prevent, repel and effectively deal with the signs of degradation in political ideology, morality and lifestyle as well as “self-evolution” and “self-transformation” from within. Thoroughly grasping directives, plans, guidance of higher authorities, particularly those on implementing the Resolution of the Party Central Committee’s 4th Plenum, the College’s Party Committee and Directorate have concentrated on drawing up plans and guidance for the implementation in a close and synchronous manner at all levels. At the same time, the College has organized training courses for its key cadres to study and grasp targets, viewpoints, tasks and measures mentioned in the Resolution as well as manifestations of political ideology, ethics, lifestyle degradation, “self-evolution” and “self-transformation” to achieve a consensus on awareness and raise their sense of responsibility towards the implementation of the Resolution. The College’s Party Committee has ordered its subordinated party committees to step up self-criticism and criticism, listen to the opinions of organizations and individuals, and promote the advisory role of functional agencies to ensure that the implementation of the Resolution meets the preset goals and requirements. To include the Resolution in the work of teaching, studying and training, and make it an incentive for cadres, instructors, cadets and employees, the College’s Party Committee and Directorate have focused on improving the quality of the ideological work for cadres and party members, particularly key cadres at all levels, and promoting their vanguard role. Realities show that the exemplification of cadres and party members (first and foremost in terms of political ideology, ethics and lifestyle) not only decides individual prestige, but helps enhance the quality of party committees and organizations’ leadership and direction over the task performance of agencies and units. Therefore, eliminating manifestations of degradation in political ideology, ethics and lifestyle of a proportion of cadres and party members serves as a regular and urgent task for the work of building the College’s Party Committee today. To this end, the College’s Party Committee has directed party committees at levels to improve the quality of education of politics, ideology, law, discipline, professional morality, and lifestyle, with a focus on managing the relationship between cadres, instructors and cadets to prevent negative phenomena from undermining instructors’ honour and cadets’ motivation for study. 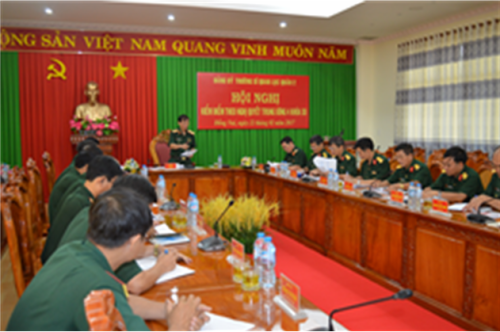 It has also directed its agencies and units to step up the studying and following of Ho Chi Minh’s thought, morality and lifestyle in tandem with the implementation of the Campaign “promoting tradition, devoting talent, deserving to be Uncle Ho’s soldiers”; enhance the effectiveness of the implementation of the “Determined to Win” Emulation Movement, and make efforts to build “Company of three good things”, “Department of three good things” as well as “Committee of three good things”. Party committees and commanders at all levels in the College’s Party Committee have heightened their responsibility, matched their words with actions, taught and learned according to the Party’s resolutions, thereby creating ideological stability in the face of complicated developments of the situation. Simultaneously, those organizations and individuals have been active in fighting against all signs of undermined faith and ideal, opportunism, ambiguity, and degradation of morality and lifestyle; while resolutely combating and preventing “self-evolution” and “self-transformation”. In addition, the College’s Party Committee has attached great importance to selecting, building and cultivating key cadres at all levels to ensure that they posses qualities and capabilities equal to the task. First and foremost, it has demanded its subordinated party committees to review, amend and supplement the Regulations on leading the cadre work, regulations and procedures for appointing, recruiting and receiving cadres; to concretize and seriously implement regulations on standards for cadre position and title; to hold confidence vote of key cadres at all levels in a just and objective manner. On the basis of the defined standards for key cadres and party committee members, it has considered individuals and units’ task performance and cadres’ prestige as a measure of cadres and party committee members’ quality. At the same time, it has encouraged a sense of responsibility of party members, maintained democracy, and adhered to standards for party committee member position during the process of building, planning, and appointing cadres. To build “both red and expert” cadre staff, the College’s Party Committee has directed party committees at levels to promote grass-roots level democracy and the advisory role of functional agencies during the process of selecting and appointing cadres so as to make a breakthrough change and gradually replace cadres and instructors at old age on the basis of guaranteeing the inheritance and constant development. Also, the College has always paid attention to training and cultivating party committee secretaries and members as well as party cell secretaries in terms of political will, morality, professional competence, working style and method, ensuring that this staff could quickly adapt to the tasks in any circumstance. The content of training has been mainly on knowledge, skills and experience to deal with the situations in grass-roots level units. Attaching great importance to improving the quality of party meeting, and combing the promoting of democracy with self-criticism and criticism serve as among the measures adopted by the College’s Party Executive Committee to implement the Resolution. Accordingly, all operations of party committees and organizations at all levels have been in accordance with their functions, tasks, and promulgated internal regulations as well as the Central Military Commission’s Regulations 104-QĐ/QUTƯ on “Several issues on implementing the principle of democratic centralism among party organizations of the Vietnam People’s Army” and the Guidance 497/HD-CT of the General Department of Politics on “Content of party cell meeting regarding the Army’s Party Committee”. Party committees at all levels have reviewed, supplemented and stringently implemented the working and leadership regulations, proactively innovated the working method and style, seriously maintained and improved the quality of the regulations and order for party meeting, particularly the quality of resolution issuance and implementation as well as that of individual and collective annual self-criticism and criticism. Due attention has been paid to promoting democracy during meetings and creating an open atmosphere for party members to give their opinions to the building of resolutions. Frank, honest, and constructive opinions must be respected and received in a willing-to-learn manner, avoiding reluctant agreement and slackened responsibility towards the building and implementation of resolutions. Self-criticism and criticism must be frank, honest and objective in the spirit of solidarity to help each other make progress. Consequently, that would contribute to opportunely detecting, preventing and handling wrongful signs and violations of Party and Army discipline and State law, particularly the signs of political ideology, morality and lifestyle degradation as well as “self-evolution” and “self-transformation” from within. Improving the quality of inspection and supervision of party committees and cells and successfully carrying out the work of management of party members have been seen as a measure of utmost importance to bring the Resolution to the realities and the teaching and learning work of the College. The College’s Party Committee has directed party committees at all levels to continue to make the work of inspection and supervision a regular task under the guideline: “focalized inspection, broadened supervision”. It has also ordered party committees at levels to proactively adjust and supplement programs and plans for inspection and supervision, with a focus on inspecting and supervising the repair of limitations and weaknesses pointed out by review, self-criticism and criticism according to the Resolution of the Party Central Committee’s 4th Plenum (12th tenure); the degradation in political ideology, ethics and lifestyle; observance of the democratic centralism principle and the Regulations on party members’ don’ts; party organizations with poor task performance and party members with low prestige. Moreover, party committees and organizations within the College’s Party Committee have strictly maintained the Party’s discipline, successfully investigated and definitely settled violations of discipline, letters of complaint and denunciation, particularly serious, complicated, long-lasting cases. Party committees and organizations at all levels have regularly and stringently maintained the Grass-Roots Level Democratic Regulations and created a favourable condition for cadres, party members and ordinary people to express their thoughts and wishes to party organizations and commanders, while managing the relationship among cadres, instructors and cadets to foster solidarity and achieve a high consensus. The above-mentioned measures will contribute to making the Resolution of the Party Central Committee’s 4th Plenum realized into the Party building and cadre training work of the Infantry Officers’ Training College No.2, thereby facilitating the building of politically, organizationally, morally strong, pure College’s Party Committee and comprehensively strong College, meeting the requirements of the education and training task in the new situation.